Twelve princesses share a love of dancing, to their father's despair. Will anyone be able to uncover their secret night-time escapades? Sisters may be related, but they certainly aren't always alike; Drusilla and Isidora are like chalk and cheese, and receive very different enchantments in the story Diamonds and Toads . TreeTops Greatest Stories offers children some of the world's best-loved tales in a collection of timeless classics. Top children's authors and talented illustrators work together to bring to life our literary heritage for a new generation, engaging and delighting children. The books are carefully levelled, making it easy to match every child to the right book. Each book contains inside cover notes to help children explore the content, supporting their reading development. Teaching notes on Oxford Owl offer cross-curricular links and activities to support guided reading, writing, speaking and listening. 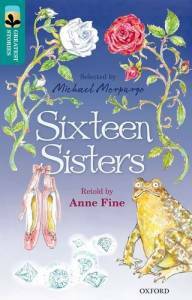 Sixteen Sisters was published by OUP on May 1st 2016. Read more about The Twelve Dancing Princesses - or another fairy tale retold by Anne Fine. Click the logo to order Sixteen Sisters from .